I love taking photographs. I take them of places, flowers, interesting architecture and art and our dog, Toby. Recently for a Kansas City Modern Quilt Guild challenge, we swapped fabric and them had to create something using those fabrics. I received the stripe, the newsprint, the medium green, the grey and blue flowers. I added more to the selection and created “Happy Toby”. Here is the photo I used for inspiration. I plan on making other versions of Toby to show how fabric choice and coloration can make an entirely different quilt. Hope you can use your photos to inspire your next work of art! 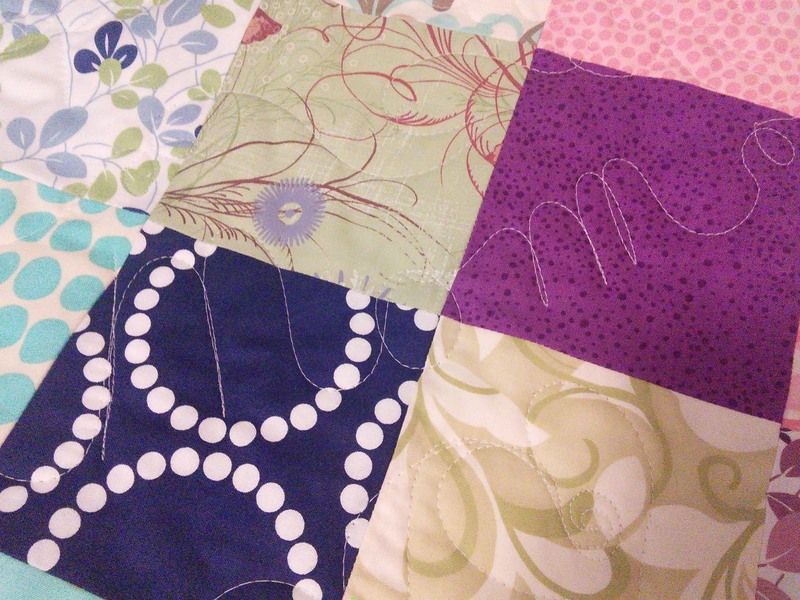 Last night was the final class of Crazy Quilting at the Sewing Labs. I have been volunteering as a teacher there for the past month. I love it! We had a great group of women who are enthusiastic to learn new quilting techniques. Each person started with a packet of various home decor fabrics. After making a 15″ square of “crazy placed” fabrics, the squares were embellished with trim, fringe, embroidery stitches and buttons. Each participant then decided how they would finish their square. Most made across body bags; two made bags with zippers and one made a pillow. We had fun while making something beautiful and learning something new. To learn more about The Sewing Labs, go to thesewinglabs.community or visit them on Facebook at the The Sewing Labs. The question mark says it all. I am wondering when I will be able to be quilting and sewing again. I had rotator cuff revision surgery on February 28th. I am in therapy and have a long way to go before I can be back in business. I am right handed and of course the surgery was on my right shoulder. My shoulder is pain free, but learning to work on its own again. My fine motor skills that are essential to hand sewing and beading are a long way from working like they should without pain. In the meantime, I miss my work and the creative part of my life. Trying left-handed is not very successful because somehow the right hand has to get involved! Even typing one- handed is a challenge! So, I am trying to look forward to figuring out the next step when my therapy is over and I can get back to work. I will keep you posted. Sometimes it seems right to not follow the piecing lines. On this very symmetrical block arrangement, I chose to do diagonal lines in triangular sections. The quilting gives movement to the otherwise linear design. By dividing up the area, I was able to work within the space on my longarm without having to roll very often. I used lines of pebbles to break up the sections. Test Patterns was my first foray into designing my own quilts. 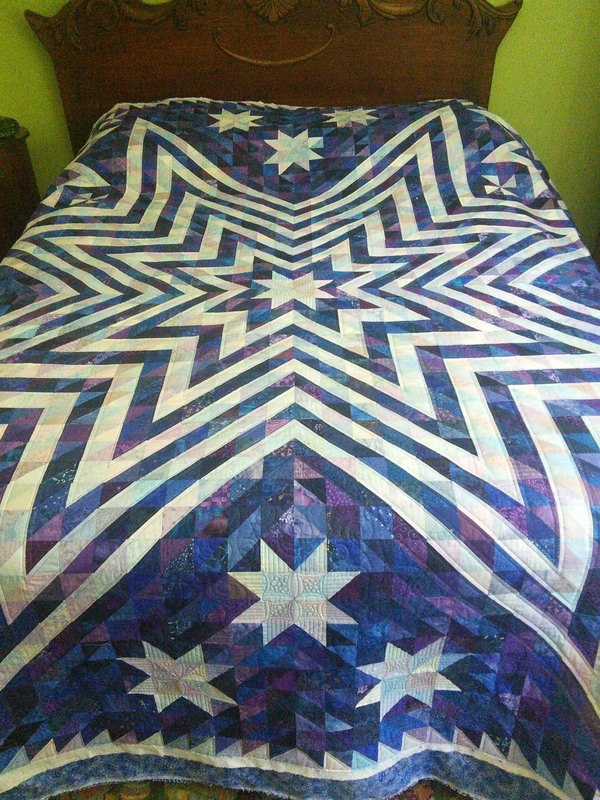 I created this quilt for a contest, which I didn’t win, but I have always liked this quilt anyway. I wanted to use some pretty bold fabric choices and an asymetrical layout of the blocks. I also took on curved piecing and raw edged applique along with fussy cutting some of the circles. I really mixed up many different elements. Maybe, too many ideas? I don’t think so because the quilt is lovely to look at. I was very fortunate to be asked to make this wonderful tribute to my neighbor’s husband. Marty’s husband, Gary, passed away unexpectedly last year. 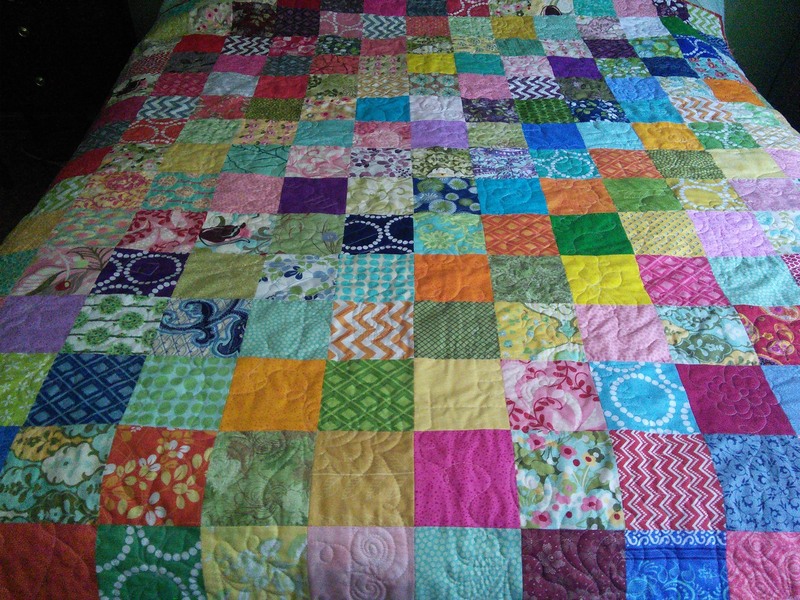 The quilt is made of his shirts that ranged in design from outdoor scenes to small checks. The variety of patterns gives the light and dark shading to the pattern. What a wonderful remembrance! My son’s, girlfriend’s sister, Alyssa, was diagnosed with B-cell lymphoma in June. She found out about the cancer on a Tuesday and immediately started chemo on Friday of the same week. What a scary proposition for a 24 year old women! She has to stay 2-3 overnights to receive the chemo drugs in each treatment. Lindsey, her sister and my son’s girlfriend, asked if we could make Aylssa a quilt to take to the hospital for her treatments. Of course, I said yes! David, Lindsey and I started Thursday evening by going through my stash of charm squares so I didn’t have to do much cutting. This was a”make it work” moment if we wanted to have the quilt finished for her first treatment which started the next day! We decided on a diagonal arrangement by color. I only had to cut 6 squares to finish out the rows. I finished piecing the charms square on Friday and put it on the quilting machine. To convey the idea of a “comfort quilt” , Lindsey gave me a list of family members and sayings that have special meaning to Alyssa. I quilted Alyssa’s name in the middle of the quilt and surrounded her with the names of her family members and even the dogs’ names. All of the family members’ names were connected by hearts and swirls intertwined with the inspirational sayings. This way she can wrap up in the ones that love her. We were able to deliver the quilt to the hospital on Saturday morning! We made our deadline of the first treatment session. Alyssa has now completed 3 of the 6 sessions of chemo. She has had some of the complications that come with this type of treatment, but is facing it with dignity and strength. We are all praying for a complete recovery. Lindsey, David and I are walking in the Light the Night event in September to raise money for Lymphoma research. If you would like to contribute to our team, go to http://pages.lightthenight.org/mid/KSCity15/JBromberg. We are on the Alyssa’s Angels Team. Any amount will help. Thanks! 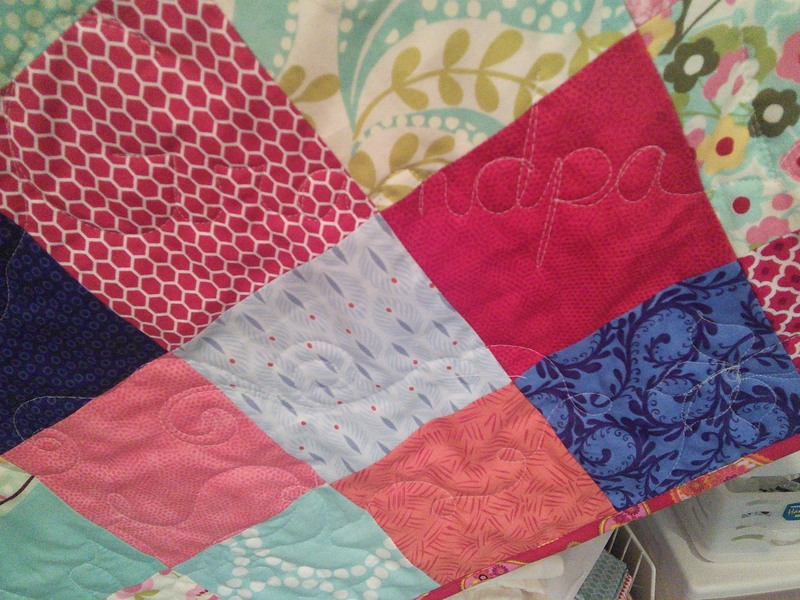 I didn’t think that this quilt needed very elaborate quilting. I did straight line ruler work on the rows that make the star shapes. In the center four patch, I chose to do double orange peels with pebbles in the center of each quadrant. 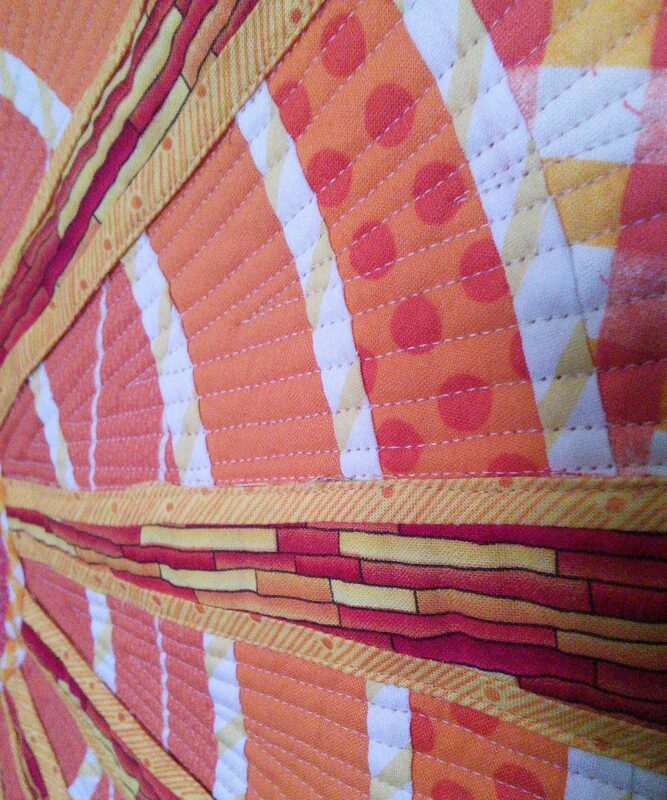 I quilted straight lines to emphasize the points. I used a gray thread that blended both with the lights and the darks. 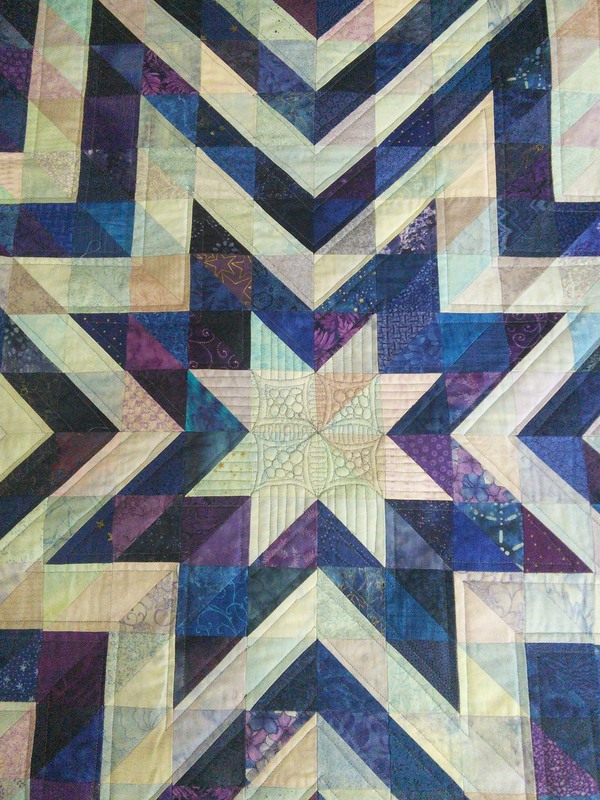 On the one row border I chose just to outline the light half of the squares. What a fun and challenging project!